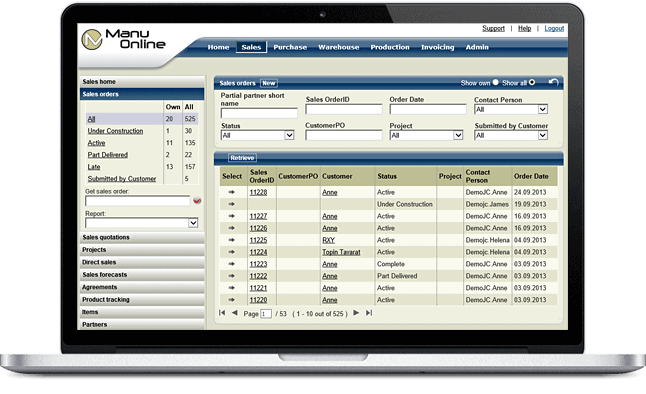 Use Manu Online to manage your order handling, invoicing, inventory and manufacturing processes. It’s all integrated. Our consultants online help you get your system running. Try our Quick Start configuration, training and data migration service. Our toolkit of add-on extensions allows you to get the features you need to support your specific business processes. Experience fast and professional ticketed support from our staff of experts. Use our professional services such as training and data migration to get your system running with the minimum of fuss. Our earliest customers have been with us for many years and continue to reap the benefits of having automated business processes to run their organisations. It’s simple to get going. Sign up now. There are no servers or licenses to buy, and it’s free for the first 30 days. Automate procedures throughout your business, significantly saving management time. Reduce stock levels and storage costs by controlling inventory and purchasing more effectively. Get products to your customers faster, and so achieve better pricing. Reduce errors in your business processes such as payments of non-delivered goods. Win large customers who have demanding procurement procedures. Benefit from online ERP without server costs, IT headaches and software maintenance. Offers advanced sales order handling, with version control, drop shipment, customer item number mapping and more. Supports sell from stock or dedicated work order. Allows for full inventory management with sales order shipping and purchase order receiving. Also multi-location inventory and multiple shipping units are available. Work orders are easily sent to production, with exact matching of work resources with sale orders. Work hours, item usage and by-products are all tracked. Sales and purchase invoicing is easily linked to order and stock activities. Integration is made seamless with support for the popular Xero or Sage One accounting systems. Having been involved in a number of large company ERP projects during my career, I would not have bought into a company like Delcon if they had not had a properly running system. Manu Online is the perfect system for a €1 million company. We acquired AT Power Throttles with a clear objective of increasing sales by 400% within 3 years. One of the first jobs was to put in a proper system to manage and automate our business processes. Manu Online was the system that beat all others we looked at. A fire in our offices destroyed the server with our old ERP system. Manu Online stepped up to the challenge and we had all our basic business processes running again in less than a week. When you loose a server suddenly due to a fire, you really appreciate the benefits of cloud systems.